Aislinn and Sebastian, along with Mya and Caleb, set off to the Amazon Rainforest in search of the legendary visionary guru. When Aislinn and Caleb become separated from the group, they must adapt to the extreme conditions of the rainforest. Fending off exotic animals, building shelter, and finding food become necessities in this mysterious world. During their separation, Sebastian and Mya are captured and must find a way to escape being sacrificed by the Rebel Leaders. Luckily, Aislinn and Caleb come to their rescue only to come face to face with an uprising. As Aislinn learns more about her spirit animal, the red-tailed hawk, she discovers that she holds the keys to her memories and that her memories hold the keys to her purpose. And without even answering me, Caleb whips off his shirt, pants, and shoes, leaving only his boxer briefs to cover his essentials. His huge biceps are barely noticeable compared to his six-pack abs. “Are you crazy? What are you doing?” I fret as Caleb jumps in. “Come on. Are you worried about what Sebastian would think?” Caleb says with a flirtatious voice. He smiles and points to the water. Well actually, I am worried about what Sebastian would think, but I’m not about to let him know that. He has a point. Standing there dripping in sweat and parched as ever, I decide to stop over-thinking everything and just do it. “Of course.” Caleb turns around with a mischievous grin. Without further ado, I take off my shirt since I have a cami on underneath. I quickly pull off my pants and place them near Caleb’s. I nervously take one deep breath and jump in before he can see anything. The water is perfect and it feels exceptionally refreshing. I sip mouthfuls of water to satisfy my extreme thirst. It’s so fresh and clean. It’s unlike any other body of water that I’ve been in. No pool, lake, or stream back home could compare. “Told you,” Caleb says while diving underneath the water. Anxiously, I look around and find him swimming directly toward me. “Don’t do what? Go under the water?” He laughs. “You know what I mean.” I swim to the other end of the glistening pool of crystal clear water and try my best to wrap my hair in a bun without any hair accessories. I never cared for hair all over my face while swimming. It just gets in the way. “So, do you miss him?” Caleb asks while swimming toward me once again. “What are you talking about?” I decide to play dumb to Caleb’s questions. I need a minute to gather my thoughts. Why is he asking me this? Caleb swims even closer to me, causing me to back up to the embankment. Water drips down his face and onto his lips. He doesn’t answer me. Instead, he just stares at me, waiting for a response. “No, it’s just-” Water suddenly splashes in my face interrupting me. I wipe my eyes and soon realize that Caleb just splashed me in the face. “Nope,” Caleb says as he flirtatiously splashes me again. “Uh-uh,” he murmurs as he does it again. I splash him back continuously and we have an all-out splash war. His splashes are much harder, so I stop splashing and curl my head into my hands and play victim. I figure it’s my only chance for survival. “What’s wrong? Are you all right?” Caleb asks as he stops splashing to see if I’m okay. I snidely lift my head and yell, “Gotcha” while splashing him wildly in the face. “You better run,” he says. “You mean swim,” I correct as I hurriedly try to get away, but he catches me. “Where are you going?” he asks while holding on to me and tickling me. I turn around and beg him to stop. I was never much for tickling. Also, I think he’s getting a little too touchy. Caleb stops tickling me and looks deeply into my eyes and for just a second, I forget where I am. I stare back at him and everything stops. My throat swallows water left from the splashing. And just as he is about to presumably kiss me, thunder rumbles in the sky. A sign from above has clearly spoken saying that this play was way too much, and I couldn’t agree more. What am I doing? 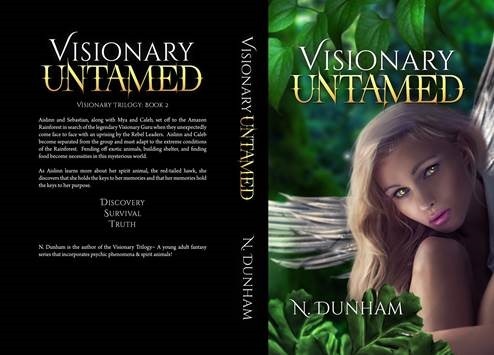 N. Dunham is the author of the Visionary Trilogy~A young adult fantasy series that incorporates psychic phenomena & spirit animals!